The availability of your pet's prescription medication from Pennington Animal Hospital's in-house pharmacy — quickly, at the right dose and with accurate instructions — is another way we work hard to be your partner in the care of your pet. 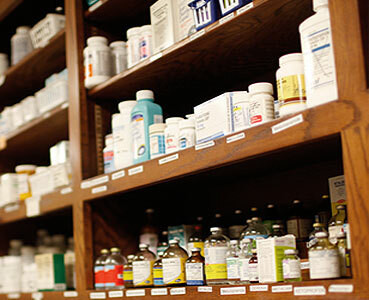 For your convenience, we maintain an inventory of pharmaceuticals, vitamins, shampoos, flea and tick control products and heartworm preventatives to meet the needs of your pet. We also carry Hill's Science Diet, Royal Canin and Purina prescription foods. If your pet requires a prescription diet we do not carry, we can easily order it for you. Ensuring that you have convenient and timely access to competitively priced medications and other pet care products is an important aspect of our veterinary practice. Refills are easy, too. Simply give us a call at 256.883.4148 or send us a request online. We've all seen the sad lost pet notices posted throughout our neighborhoods. When your pet gets lost it's more than an inconvenience: it's the number one cause of pet death. Of the more than 10 million pets get lost each year, about 90% of those found would not be returned to their owners if they hadn't had some form of permanent lost pet identification. This is why the team at Pennington Animal Hospital considers the Microfindr Slim microchip pet ID a fundamental part of protecting your pet. With the Microfindr ID system, there is a one-time fee to register your pet for life with the Pet Link Lost Pet Recovery Database. You can update your information at any time, and unlike other microchip brands, there are no recurring annual charges. With a microchip, your pet can be identified quickly and easily by animal control officers, shelters or at veterinary hospitals around the world. Microchips are safe, unalterable and permanent identification for pets. The entire implant procedure takes less than 10 seconds. 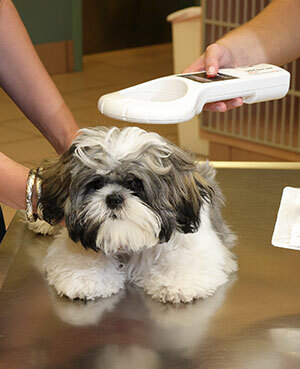 When traveling domestically or internationally with your pet, he or she will need a health certificate. For your convenience, we provide Interstate and International health certificates. Because each destination country has different requirements for your pet's entry, we ask that you investigate your destination's requirements prior to your appointment. We will accommodate the guidelines you provide. Although we are happy to help, Pennington Animal Hospital cannot assume responsibility for ensuring all the requirements are met for your particular situation and cannot be held responsible for quarantine, denial of entry or costs incurred due to unfulfilled requirements for your pet. For many pet owners, even thinking about their pet's final days is difficult and emotional. Our pets are a part of our family. It is this strong bond, born from years of love and loyal companionship, that makes this time particularly hard to bear. We encourage you to talk with our veterinary healthcare team about these issues before they become an urgent matter. Find out about your options, including our at-home euthanasia and cremation services, make some key decisions ahead of time and ask us to add this information to your pet's record. 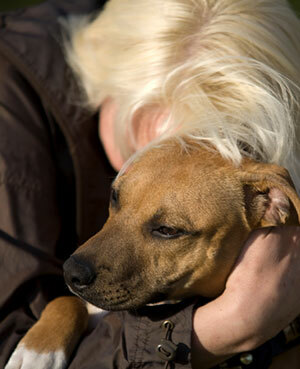 Taking the time to plan, as challenging as it may be, will lessen the pain and stress for you and your pet. In the days, weeks, or months leading up to your pet's final day, you can rely on our veterinary team to provide you with the information you need to make informed choices each step of the way. We also offer grief counseling, should you need it. All of us at Pennington Animal Hospital will do our best to help you prepare for these important issues with the compassion and sensitivity they require. If you would like more information about the client services Pennington Animal Hospital offers to help best serve your pet care needs or to schedule an appointment at our animal hospital in Huntsville, please call 256.883.4148.